A beautiful 3 bedroom 2 1/2 bathroom house on 5 private wooded acres. Spacious hilltop retreat with natural beauty, privacy, views, solar-heated pool, hot tub, nestled in rolling oak/pine/manzanita forest outside of Grass Valley. Open common space and spacious well-stocked kitchen. Three bedrooms sleep eight (mats / sofa beds extend capacity to 12). Garage with foosball, ping pong, games. No cable but TV with DVD and HDMI cable for playing movies. No internet will leave you relaxed! Beautiful mountains, river, snow, biking, Nevada City and Grass Valley nearby. The house was built in 2005 with excellent insulation and double pane windows throughout. It is furnished in rustic but comfortable mountain style. The house has a fantastic open floor plan. The kitchen is spacious and well stocked, and it's easy to cook and converse with folks in the common space. There is a large dining table that can be expanded to seat 12, as well as 2 comfortable couches, and armchairs by the cozy indoor gas stove. The central heat and A/C work great. A sunny deck with 5-person hot tub, outdoor shower, and retractable shade-awning overlooks a beautiful wooded ridge beyond the enclosed back yard. Outdoor picnic table and benches are perfect for breakfast or dinner and several zero-gravity chairs make for great outdoor lounging or reading. On the other side of the house, a brand new, elegant, large swimming pool blends beautifully with the natural forest setting. Solar heat allows swimming from May through September. Garage has ping pong, foosball, plenty of board, card games, and hang out/ sleeping space perfect for older kids and teens (weather permitting). 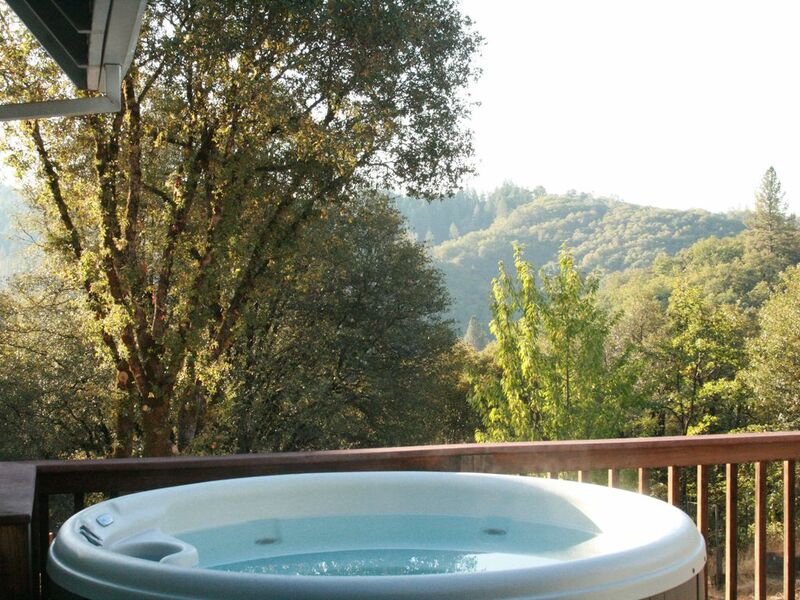 The property is on 5 acres with end-of-the-road privacy and opportunity for nature walks, and an easy paved drive to gold-rush era towns of Nevada City or Grass Valley as well as wineries, river crossings and Sierra outdoor adventures. The house is perfect for 2 families and features a fully fenced beautiful new private 40' x 18' swimming pool with cabo shelf and diving board. Also has a hot tub on back deck with beautiful views. My family and I stayed here for the week of 4th of July. My kids, ages 5 and 10, loved the house and the pool. It is great for kids with lots of games and bunk beds to sleep in. The views from the deck are incredible. The highlight was the pool. This may be the best pool we have swam in awhile. In fact, it was hard to convince my kids to leave the house because all they wanted to do is swim in the pool. The house has all the modern convienences and is super relaxing. I highly recommend it! Hi Ana, we're so glad you all enjoyed the house! Come again! Enjoyed the kitchen and space to prepare meals. Our property is centrally located 2 hours and 15 minutes from the S.F. East Bay, and an hour from the ski slopes. More locally, there are 4 crossings of the majestic South Yuba River within 30 minutes. Grass Valley is 15 minutes and Nevada City is 20 minutes away. Grass Valley and Nevada City are vibrant communities which are home to many unique restaurants, wineries, film and music festivals as well as community events. Check out the Wild n Scenic environmental film festival, WorldFest, or Mardi Gras in Nevada City, to name just a few. No public transportation. Cell service is spotty near house, so it is helpful to print or download directions before losing connection.